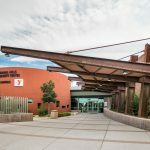 The Las Vegas Pavilion Recreational Center is popular destination in Summerlin, Las Vegas, with its main attraction being its beautiful, 14-lane Olympic-sized competitive training pool—which is enjoyed by Vegas residents year-round. 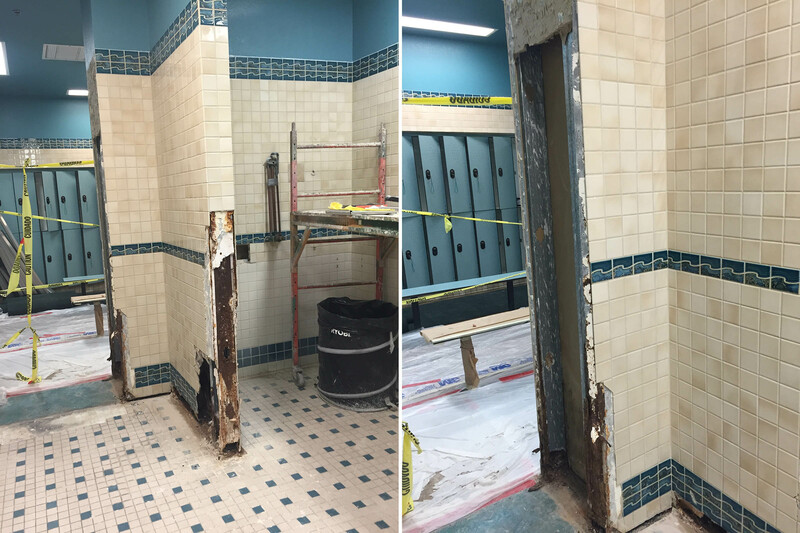 However, the facility was experiencing several issues with the pool-adjacent showers, including an uneven surface that was causing water to pool on the floors, resulting in a slippery, wet public safety issue. In addition, the grout in the handicap shower hadn’t been properly waterproofed, allowing water to seep in and cause mold. 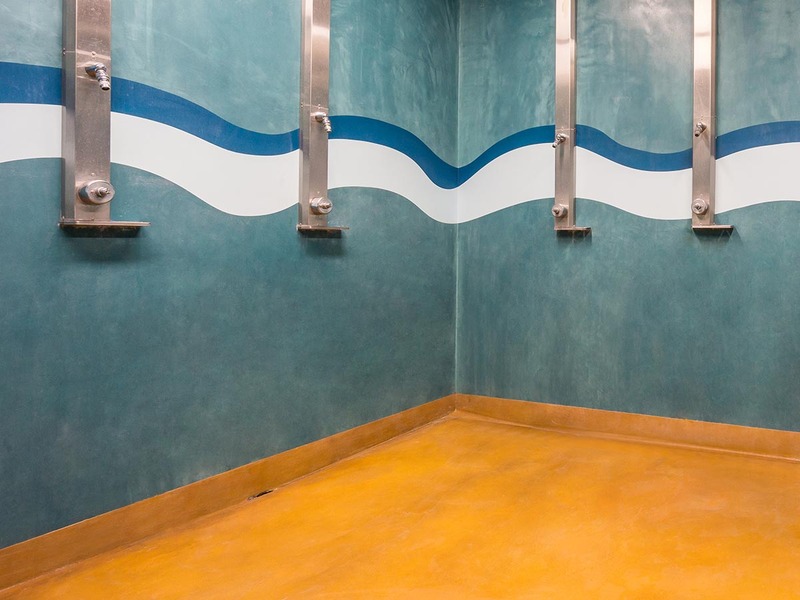 Case Study: Showers at the Las Vegas Pavilion Recreational CenterPublic Safety Issue: Uneven floor was causing water to pool, resulting in a wet and slippery surface. 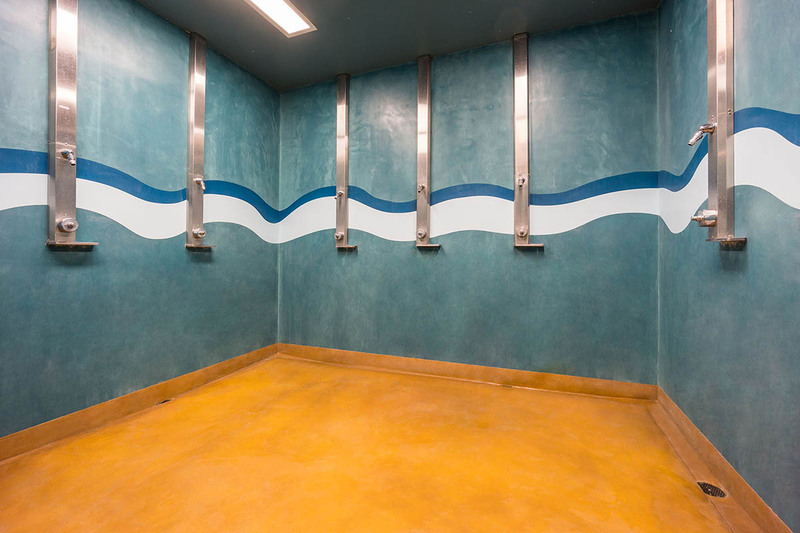 Case Study: Showers at the Las Vegas Pavilion Recreational CenterShower walls and floors were not properly waterproofed, allowing water to seep in and causing mold to grow. The SEMCO Surface Engineering team was called upon to address the slippery shower surfaces and a lack of proper waterproofing. 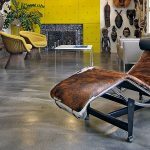 Its signature X-Bond Seamless Stone ADA Safety Floor product provided the perfect durable, environmentally friendly, and slip-resistant solution. The city first considered removing and replacing all the facility’s existing tile, then re-pouring new concrete to create a better slope to meet the coefficient of friction safety code. 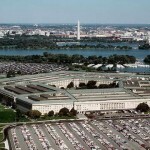 However, the process would require at least 5-7 weeks to complete, assuming there were no additional problems. Since the indoor pool is open year round, it was decided that the prolonged closure would cause hardship to the city—especially given Vegas’ high summer temperatures that last well into the fall months. They needed a quicker and more cost-efficient solution. That’s where SEMCO came in. 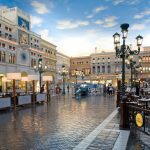 Having worked with us on previous projects, the City was familiar with the advantages of SEMCO’s X-Bond Seamless Stone and ADA Safety Floor. 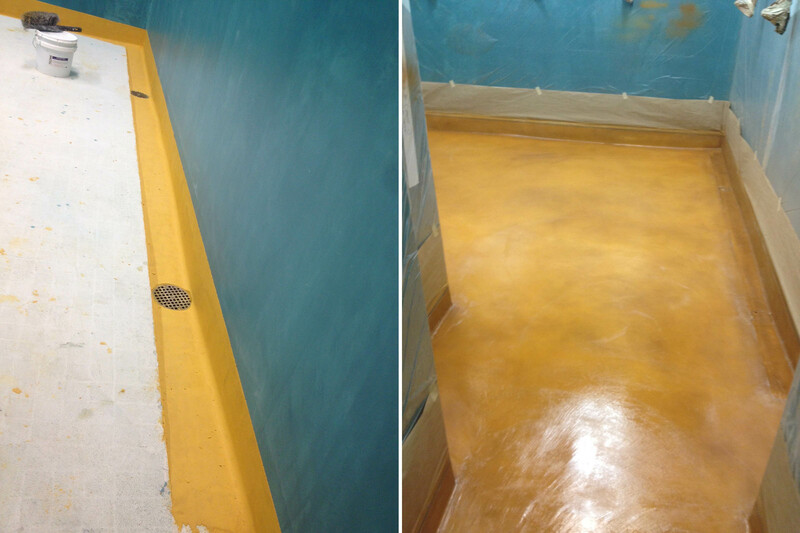 It can be applied directly over any solid surface without the need for demolition, saving time and money. In addition, its rapid application, cost effectiveness and proven durability over 25 years was ideal for the Pavilion recreational project. We submitted an 8-day work schedule, promising to complete the work without having to close access to bathrooms or locker rooms. 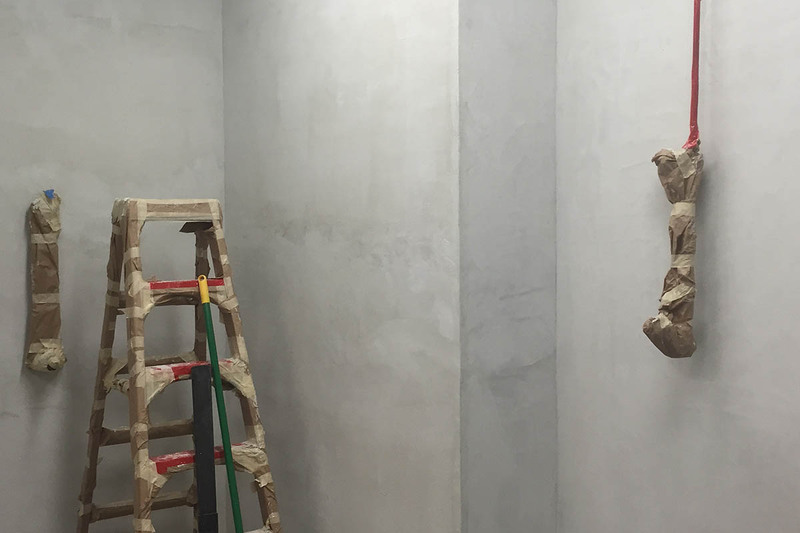 Our first step in the process was to remove the loose tile and clean up the mold, using our environmentally friendly Semco’s Nu-Lift biodegradable cleaner and Stone Soap, prior to applying the X-Bond Seamless Stone. Upon removal of the tile, we discovered that the cement board panels needed to be replaced. We replaced them and applied a skim coat over the tiles, creating a smooth, untarnished floor surface that was ADA-compliant. 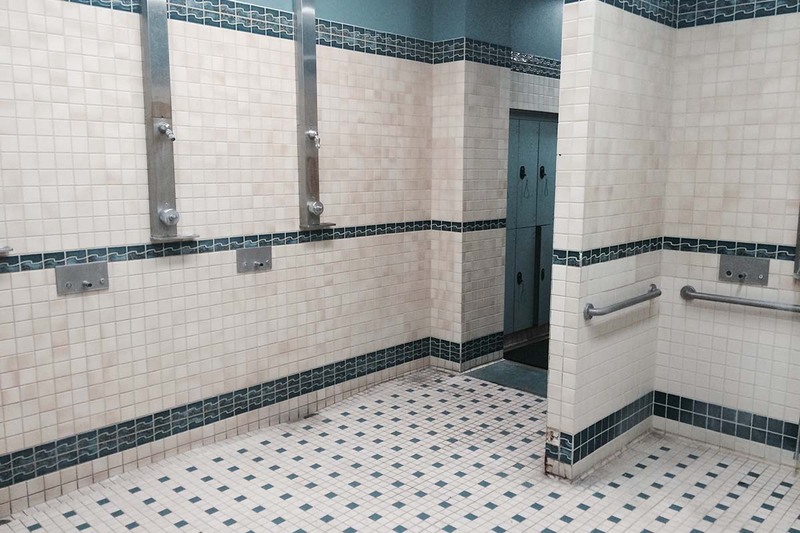 Case Study: Showers at the Las Vegas Pavilion Recreational CenterNew X-Bond Seamless Stone ADA Safety Floor is applied directly over existing tile substrate. Once the smooth, white X-Bond Seamless Stone surface was installed, it was like a blank canvas, awaiting artistic inspiration. 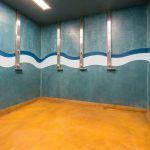 Case Study: Showers at the Las Vegas Pavilion Recreational CenterX-Bond Seamless Stone applied over existing tile substrate. 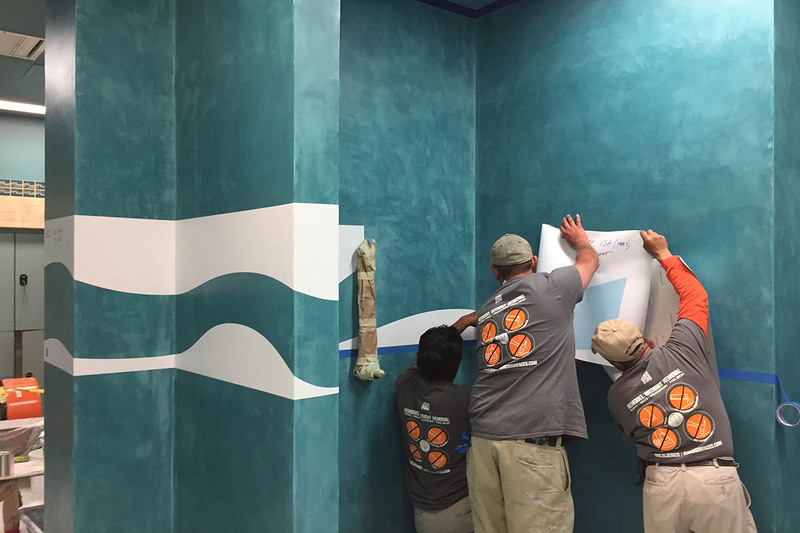 To make the project even more aesthetically appealing, Semco’s in-house graphic designer was asked to custom create a new look for the space. 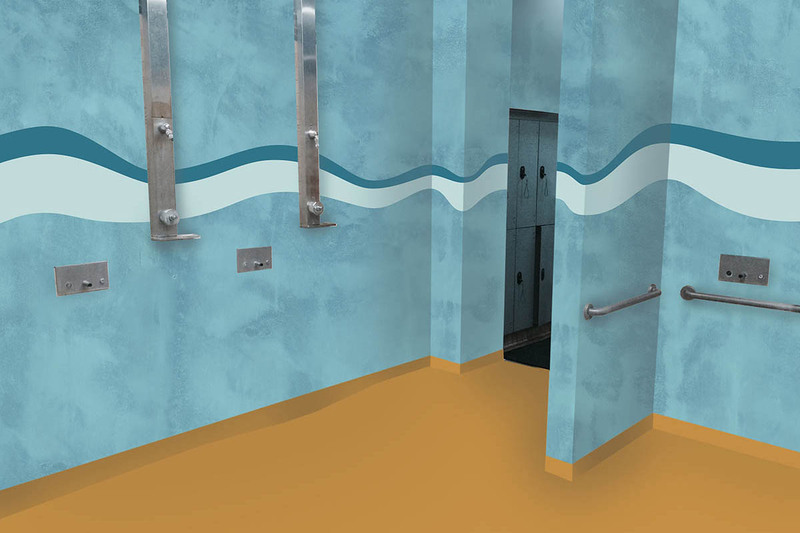 Case Study: Showers at the Las Vegas Pavilion Recreational CenterArtists’ rendering of new wave design. 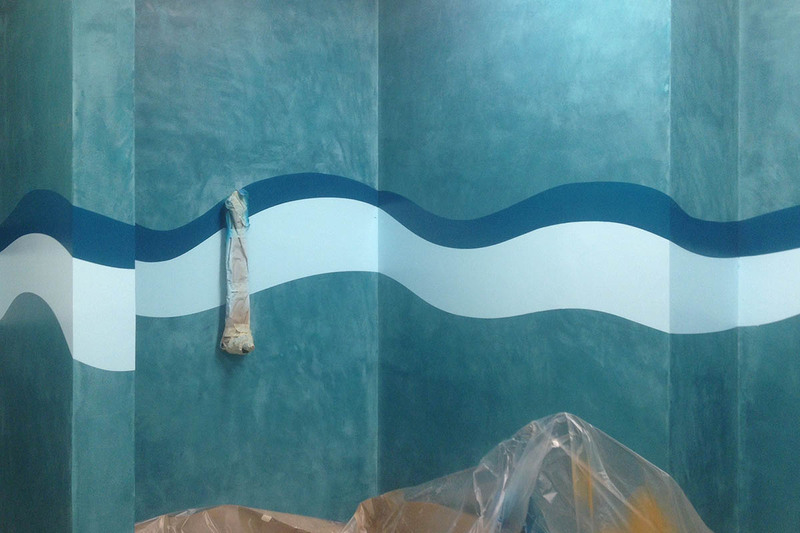 Case Study: Showers at the Las Vegas Pavilion Recreational CenterSemco installers place Wave design stencils. Case Study: Showers at the Las Vegas Pavilion Recreational CenterCompleted Wave design. 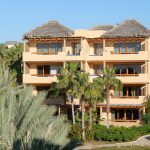 The end product was a sensational wave design that elevated the property from unmemorable to remarkable. The energetic feel of the wave design was the perfect fit for a recreational facility, and Semco transformed the Pavilion Center’s otherwise lackluster showers into something stunning. 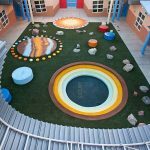 The City was very pleased with the final product: a durable, seamless, slip-proof surface that elevated the look of the recreational complex. Not only did we ensure that the project met all critical public safety standards, we also created a beautiful environment to be safely used by Las Vegas residents for decades to come. Case Study: Showers at the Las Vegas Pavilion Recreational CenterBeautiful and meets all critical public safety standards.